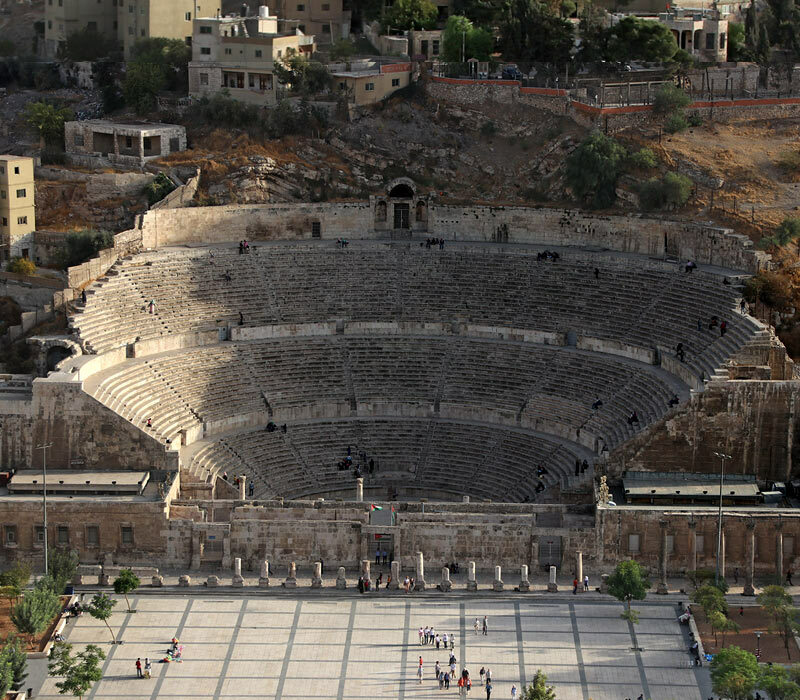 The Roman Theatre is the most impressive monument of old Philadelphia, as Amman was known when it was part the Roman Decapolis, the cities network on the frontier of the Roman Empire in the southeastern Levant. According to an inscription, it was built during the era of the Antonine emperors, at the end of the 2nd century AD. Its tiered, semicircular seating space, carved into the Jabal Al-Jofeh hill in three horizontal sections with a total of 44 rows can seat around 6,000 people. It faces north so that the audiences are protected from the sun. Social rank dictated the places for the audience. The urban poor, foreigners, slaves, and women were restricted to the upper section. The stage building, about 100 m wide, was probably three storeys high. The wooden stage elevates 1.5 meters from the the chorus performance space, the orchestra, which has a radius of 13 meters. 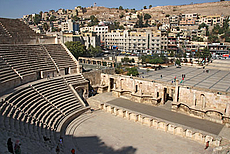 Today, the Roman Theatre is again in use for performances, concerts, and events. In addition, halls on both sides of the stage house two small heritage museums: The Folklore Museum and the Museum of Popular Traditions. The row of columns in front of the theatre is what remains of the colonnades which flanked the Roman Forum, a public square, once among the largest of the Empire (100 x 50 metres). East of it is the Odeon, a smaller Roman auditorium for musical performances.